Connect freight to the top, most reliable intermodal freight container owner operators across the United States. Direct Drive Logistics coordinates reliable truck drivers and motor carriers to deliver freight safely and efficiently. If you have the availability to extend your transit time a few days, Intermodal can be more cost effective alternative to over the road transportation. Although transit times may be a day or two longer, Intermodal freight transportation can be worth the time when shipping 500 miles in and out of major metropolitan areas. Intermodal freight shipping containers are easily moved from one means of transportation to another, loaded and unloaded from train to truck. Full truckload (FTL) and less than truckload (LTL) intermodal shipping brokerage services are available from Direct Drive Logistics. Direct Drive Logistics is your partner in Intermodal Freight Shipping. We have the dedicated, caring staff to find a cost effective Intermodal shipping solution for your specific freight transportation needs. Intermodal freight carriers are an alternative to dry vans or trucks for domestic shipping. In the logistics industry, many of our competitors make the mistake of putting too much emphasis on speedy travel times. They often actively seek out the quickest, most direct shipping routes in order to present their customers with the fastest arrival times, and avoid the extra work that would go into setting up multiple outlets for transportation. However, we here at Direct Drive Logistics understand that clients who may not be as pressed for time are usually better off with a reputable intermodal shipping route. Rushed shipments can lead to miscalculation and inefficiency. As long as everything is established correctly through a professional logistics company like Direct Drive, intermodal shipping routes can efficiently use a combination of different transportation methods in order to make sure that your cargo arrives safely while managing to drastically cut overall freight costs. Due to the fact that multiple different forms of transportation come into play with intermodal shipping, if every minute detail of the cargo’s transit route is not meticulously taken into consideration, you may find yourself facing costly delays, missed deadlines, and exceptionally angry business associates. This is why it’s important to use Direct Drive Logistics’ team of industry leading intermodal logistics brokers and shipping specialists. Compared to traditional methods of domestic shipping, Direct Drive Logistics has effectively streamlined the shipping process in order to provide clients with an economical shipping option that is specifically tailored for cargo that will be travelling a long distance in and out of metropolitan areas. We offer a variety of different sized containers that can be quickly, safely, and efficiently transferred from one means of transportation to another ensuring that the shipment in question spends less time sitting stationary, and more time in transit. Learn more about intermodal shipping solutions and how third party logistics works. For large shipping orders that take up a lot of space, a 53 ft. container will most likely be your best option. This cargo transporting behemoth, standing almost 9 feet tall by 8 feet wide, provides Direct Drive’s clients with a convenient way to bypass the time consuming, labor intensive, and costly process of unloading and reloading the same cargo multiple times. It is perfect for intermodal shipping and allows for a smooth transition between the combination of freight bearing ships, trains, and cargo trucks. They are great for domestic transportation, and are often regarded as the most bang for your buck if you plan on regular long-distance shipments. Slightly smaller than the 53 ft. cargo container, the 45 ft container brings with it all the same shipping benefits in a slightly smaller vessel. Typically 45 ft containers are used as a convenient method for transporting items on standard shipping pallets. 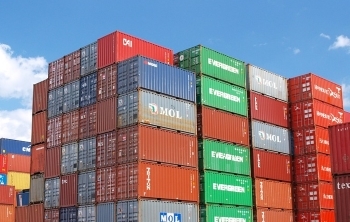 The 45 ft container is currently one of the rarer shipping containers currently in use, as consumers are beginning to favor the 40 ft container due to their comparable size dimensions and extreme popularity of the 53 ft container. As a bit of a fun fact, crafty minds are engineering ways to turn standard 45 ft. containers into some extremely impressive homes, man caves, and outdoor cabins! The 40 ft. container is usually thought of as the “middle child” of the cargo storage/shipment vessel family of heavy duty, intermodal, shipment containers. It is perfect for anyone who needs to effectively transport items across the country, ocean, or use intermodal transportation methods. The 40 ft. container is great for convenient swapping between ship, train, and automobiles, and provide an excellent way to affordably ship your company’s products, raw materials, or other materials to their ultimate destination. So, ship comfortably and smart while avoiding the constraints of smaller shipping containers. The 20 ft. shipping container, the smallest of Direct Drive’s available shipping container methods, is the perfect option for a one time small cargo shipment, or regular business shipments on a consistent basis. Despite being under half the size of the largest 53 ft container, the dimensions of the 20 ft. intermodal carrier is still capable of safely holding a great deal of cargo. In fact, the 20 ft. container can, on average, easily ship 10 full sized pallets. From trains to automobiles, the substantial amount of money that you are able to save using multiple methods of transportation is certainly worth it if you can afford the cost of a few additional days en route. Facing a deadline and in need something a little faster? Looking for temperature controlled or other specialized shipping needs? Check out some of our other means of cargo shipment, because Direct Drive will transport, store, warehouse, and handle all of your company’s logistic needs. Direct Drive Logistics is your partner for brokerage, US freight forwarding or a full-fledged partnership as a third party logistics company. Get in touch and let's discuss your shipping needs. Get a free freight quote for intermodal freight from the nationwide brokers at Direct Drive Logistics.